IN what has been otherwise a relatively fast news week, it was reported that tar has finally been caught dripping from a funnel at Trinity College after almost 70 years. 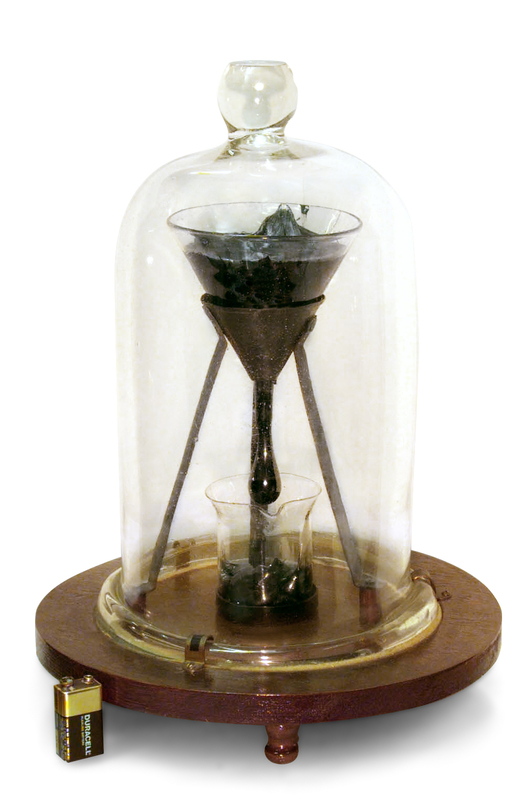 The experiment to prove the viscosity of tar was set up in 1944, no doubt in a fever of hope and excitement, but in succeeding years the funnel of tar gradually made its way into a cupboard, to be more or less forgotten about. From time to time, it appears that drips were noticed, but because not being photographed is the surest sign that you don’t exist, the results were unsatisfactory. It is not sufficient merely to drip, you must drip on camera, so a 24-hour webcam was installed, and this week, finally, reports emerged that the tar had done the needful. We’re used to physicists waiting years for something ostensibly insignificant to happen (to wit, the Large Hadron Collider, in which roomfuls of them were observed weeping for joy at the sight of a blip on a computer screen), but this is a bit extreme. The results will now be written up and published in an international scientific journal. There’s bound to be some competition among postgrads to write that research report, as it will surely be the shortest physics paper ever: “An experiment was set up to establish whether or not tar would drip. It dripped.” Whoever writes it has then nothing to do but sit back and wait 60 or 70 years for the peer reviews.